Publishing the Law on the use of languages and the Law on ratification of the final agreement for the settlement of the differences over the name with the Republic of Greece in the Official Gazette of without the President of the Republic of Macedonia’s signature on the decree promulgating the laws is an insidious deliberate act of high treason and an act of violence against the constitutional order and the security of the Republic of Macedonia by Talat Xhaferi and the Director of the Official Gazette Martin Kostovski. Anything could be expected from Talat Xhaferi. As the creator of the discussion with silence, now he invented the footnote in the decree promulgating the law. Talat Xhaferi can be read like a book of a proven manipulator, for whom neither the Constitution nor the laws are important. It is important for him only to implement the Tirana platform, to destroy the constitutional order of the Republic of Macedonia and to introduce a bilingual language across the whole territory of the country. Macedonia is an infamous example of how a national minority is terrorizing an entire nation. Traitor Zoran Zaev lied to the people the whole time that we had an excellent Constitution and swore in his ancestors and children that the Constitution would not be altered, but he did exactly the opposite. He went against the will of the people. He went against to the will of the people expressed in the referendum held on September 8, 1991 and the referendum on September 30, 2018. The laws are promulgated with a decree, and the decree for promulgating the laws under Article 75 of the Constitution is signed by the President of the Republic and the Parliament Speaker. The promulgation of law is necessary to fulfill that cumulative condition, and it is the Decree to be signed by the President of the Republic of Macedonia, as the first signatory and the Parliament Speaker. Without these two signatures on the Decree for the promulgation of a law, there is no decree and no law is passed. What happened after the publication of a law without the signature of the President of the Republic of Macedonia on the decree is a unique example in the world. It is a dangerous precedent in the decree promulgating a law to have a footnote instead of the signature of the president of the state. This has not happened even in the darkest dictatorial regimes. With that footnote, Talat Xhaferi tries to conceal the abuse of the position with a false explanation why the law is published without the signature of the President of the Republic of Macedonia, and his intention is completely clear to jeopardize the constitutional order and the security of the state and to publish an unconstitutional law. Pursuant to Article 87 of the Constitution, the President of the Republic of Macedonia is responsible for violating the Constitution and laws in exercising his rights and duties. Starting from this Constitutional provision, the President did not sign the Decree on promulgating the Law on the Use of Languages and gave concrete written remarks on violation of the constitutional provisions with that law for 19 of the 25 provisions from the Law and submitted them to the Parliament. 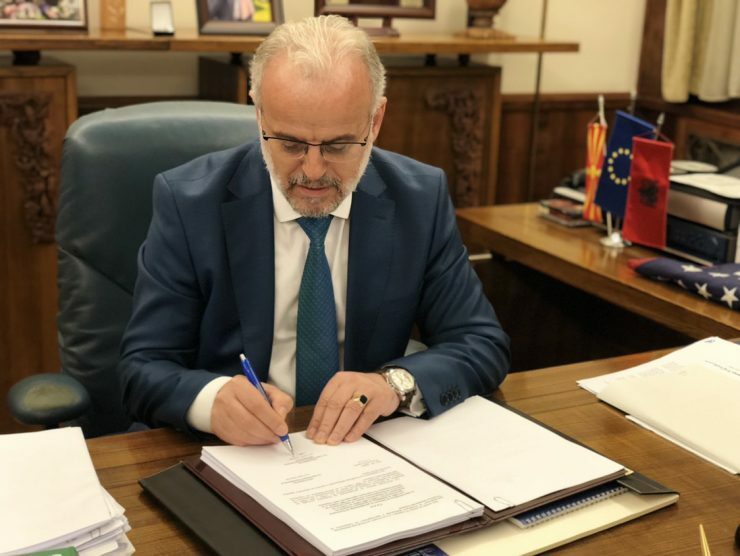 After the written remarks on the law by the President of the Republic of Macedonia, Talat Xhaferi did not take any actions, thus violating the Parliament’s Rules of Procedure. According to Article 173 paragraph 2 of the Rules of Procedure, if the President of the Republic decides not to sign the decree for promulgating the law, the Parliament shall review the law in the third reading phase, within 30 days from the day of passing the law. After reviewing the law, the amendments may only be submitted in relation to the remarks of the President of the Republic. Talat Xhaferi deliberately did not put the Law on the Use of Languages for reconsideration and was obliged to do so. In doing so, he grossly violated this obligation and totally ignored written remarks by the President of the Republic of Macedonia, which were submitted on the basis of his constitutional powers. Talat Xhaferi did nothing about the President’s remarks? Without reconsidering the law, Talat Xhaferi simply violated the provisions of the law, put the law on the vote. In this way, Talat Xhaferi not only brutally violated the Rules of Procedure, but completely ignored the President’s remarks on the unconstitutionality of 19 provisions of the Law and thus grossly manipulated the Parliament. How can the President of the Republic of Macedonia be expected to sign a decree promulgating an unconstitutional law without considering his remarks? This is a dangerous unconstitutional precedent to bypass the President of the Republic of Macedonia, who has the right and duty to take care of constitutionality and legality. The Constitution gives the President of the Republic of Macedonia a suspensive right to return the law to Parliament with concrete written remarks on why he does not sign the decree for promulgation of the law and why he is returning the law for reconsideration. The law on the use of languages is completely contrary to the Constitution of the Republic of Macedonia. All this time, this law is being pushed violently. The amendments (83) submitted by VMRO-DPMNE concerning the abolition of the provisions for bilingualism on the whole territory of the country and requiring the deletion of all provisions of this Law that are contrary to the Constitution of the Republic of Macedonia, even provisions of two-thirds laws, were not reviewed by the Commission on European Affairs, which is not competent for this law with a false European flag, while Artan Grubi and Talat Xhaferi, both in the Commission and in the plenary session of the Parliament, totally blocked the amendments and not a single amendment was reviewed. Is this parliamentary democracy? The Constitutional Court of the Republic of Macedonia is obliged to initiate a procedure for assessment of the constitutionality of the Decree on promulgating the law and the Law on the Use of Languages and to determine an interim measure to prevent the application of the law until the Constitutional Court’s decision, and to initiate a procedure for assessment of the constitutionality of the Decree on promulgation and the Law on Ratification of the Final Agreement for the settlement of differences over the name with the Republic of Greece. The law on the use of languages is unconstitutional, incomprehensible and inapplicable. Zoran Zaev, in order to keep his power at all costs, keeps the state and the fate of the Macedonian people hostage. The application of this law will lead to blockade and disintegration of the legal system. With this completely unconstitutional law, the work of all state bodies, all institutions at all levels will be totally blocked. The work of administrative and judicial authorities will be blocked. A totally inefficient system is being generated which will bring down the state to its knees so that it cannot function and disintegrate itself. Is it the price to be paid for Zoran Zaev to remain in power at all costs? Is the power worth to sacrifice the state and the people? That is why the Constitutional Court is obliged to adopt an interim measure to prevent the application of the law. The Constitutional Court, as a guardian of constitutionality and legality, is obliged to apply the Constitution after the conducted procedure and to adopt a Decision to annul the Decree on promulgation and the Law on the Use of Languages. The Constitutional Court is obliged to annul the Decree on Decree and the Law on Ratification of the Final Agreement for the settlement of the differences over the name with the Republic of Greece, which are contrary to the Constitution and the expressed will of the people in the referendum held on September 8,1991 and the failed referendum on September 30, 2018. The Public Prosecutor of the Republic of Macedonia is obliged to initiate criminal proceedings for sabotage and an act of violence against the constitutional order and security of the Republic of Macedonia against Talat Xhaferi and against the Director of the PE Official Gazette Martin Kostovski for abuse and overstepping his authorized powers. The rule of law must not be just a slogan. Restoring shattered confidence in the rule of law is achieved only by applying specific legal liability measures. Let’s hope that the decisions of the Constitutional Court and the Public Prosecutor in the concrete case will ultimately mean a turning point in the return of the shattered confidence.